Take the Lead Retreats truly serve to expose our middle school Team Captains to different neighborhoods, Universities, and cultural experiences throughout the City of Chicago. Our kids travel from all around the city to meet their fellow Team Captains, engage in leadership activities, and most importantly, have fun. 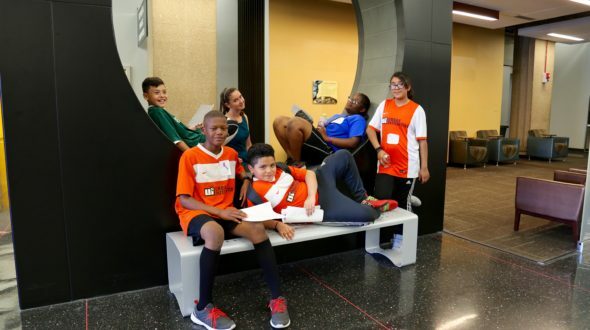 This past weekend, middle schoolers made their way to University of Illinois at Chicago for a day of soccer, friendship, and fun before the summer commences! Middle Schoolers spent their day in a self-guided tour! Team Captains had the opportunity to do a “scavenger hunt” throughout the University. Students found the architecture building, found their favorite study spot in the library, and even spotted the Argentinian Men’s National Soccer Team! Team Captains also experienced the UIC’s Student Recreation Center and played in its indoor futsal court. One team, the “South Side Knights,” unified behind the values of teamwork, sportsmanship, and pure love of soccer. This was even the first time coaches jumped in the game, and played alongside the Team Captains. It was a constant sight to see Team Captains encouraging and high-fiving each other, and simply enjoying themselves while working together. As coaches, it was amazing to see young middle schoolers just having fun while creating lasting friendships with each other. The day ended with our first annual Take the Lead Awards Ceremony to recognize and reflect on all the hard work our Take the Lead Team Captains put into the school year. We were lucky to have Mike McGrew, a member of UI’s Board of Director, speak to our kids about working hard, taking risks, and building a strong support system. His message truly resonated with our Team Captains as they left with a renewed sense of inspiration to continue to serve as mentors to younger teammates and work hard to achieve their goals during the summer.